Footmaker creates a simple - parametric - humanoid foot as a starting point for a character's foot. Options include rough shaping of the ankle - arch - and toes/shoe. This script is intended as a companion to Handmaker.ms - which creates a simple parametric hand. Help you to create mirror morph target like left sneer to right sneer etc.After using default mirror tool you cannot use the model as morph target. You can use this script to mirror the morph targets ( basically for creating left eye brow up right eyebrow up etc.) Copy the target what you want to mirror. pick the head and copied target object. click the mirror button to create mirror morph. The SkinOrDie Script is a set of tools which will improve your workflow for skinning enormously. It's intention is to completly replace the interface of the standard max skin modifier and give you a more intuitive one. RagDoll Utility Launcher. 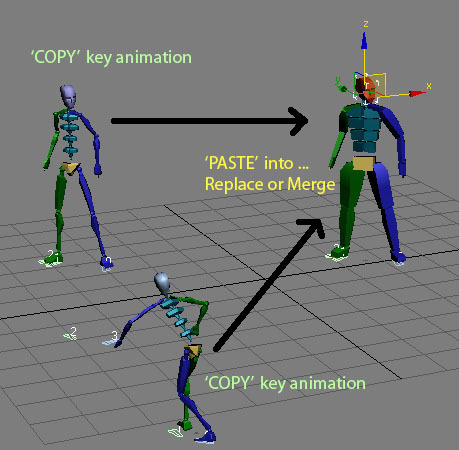 Simple macroScript for launching the RagDoll utility shipping with 3dsmax 6.0. BonesPro 3 to Skin will convert the selected BonesPro3 modifier to a Skin modifier - translating vertex assignments.